Announcements / Journey Planet #39 - Judge Dredd issue! Free! 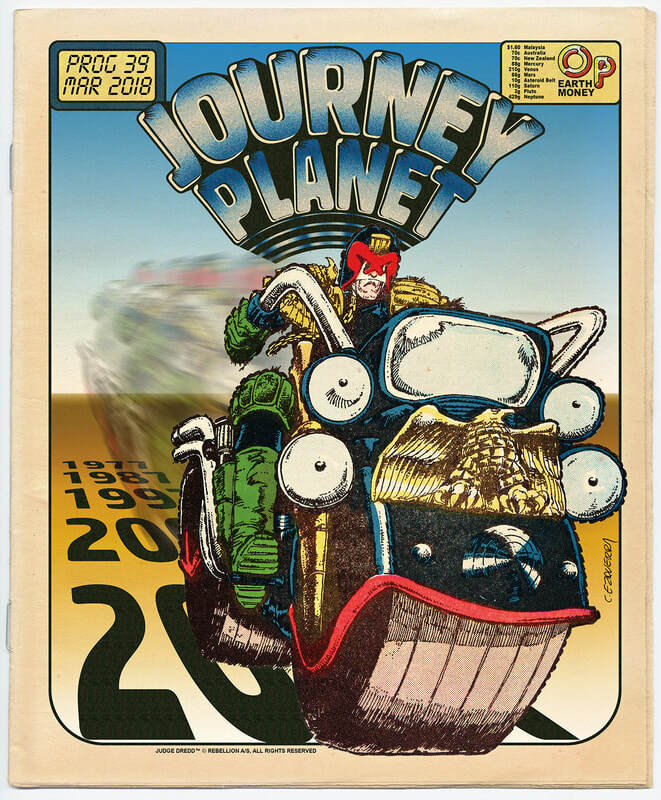 Now on-line, totally free and ready for you to download - the Judge Dredd issue of Journey Planet, the Hugo Award-winning fanzine! Packed with all-new articles on Dredd, the creators that shaped him, features from the folks behind the Dredd fanzines Zarjaz and Sector 13, plus interviews with Patrick Mills, John Wagner, strips, art, reviews, and much much more! Trailers / MOVED: MAGNIFICENT SEVEN!!!!! This topic has been moved to Film & TV. James Bacon interviews me on the Dublin2019 blog about Judge Dredd: Blood of Emeralds. Dublin2019 is a bid to bring Worldcon to Dublin in 2019 - lots of great stuff on the site! Yes, it's self-promotion time here again! Today I'm pushing the Kindle edition of Razorjack: Double-Crossing - an original novel set in the world of John Higgins' Razorjack. The book was originally scheduled to be published in 2011 - and indeed there was a limited edition for the launch; about fifty copies were printed - but for a variety of reasons the project never went any further. So I've decided that it's high time there was a Kindle version! Check it out on my website, which contains all the necessary links for you to buy it from Amazon, no matter where you are! News / MOVED: 2000AD Message Board Advent Calendar COMMENTS thread. Creative Common / MOVED: Exclusive Interview with Diane Drake, writer of "Only You" and "What Women Want"
This topic has been moved to Holding Pen. I'll be appearing at this year's European Science Fiction Convention this coming weekend (22-24 August 2014) in Dublin! Other guests of honour include Jim Fitzpatrick, Seanan McGuire, Andrzej Sapkowski and Ylva Spångberg. Plus, of course, there'll be lots and lots of other guests (Eurocons tend to only name the Guests of Honour, for historical reasons that escape me). Do come along - it'll be a blast! A reminder for anyone attending this year's San Diego Comic-Con: the 2000AD Zarjaz Hour is taking place on Thursday at 14:00, in room 29A. Moderated by Mike Molcher, the panelists include Jock, Chris Burnham, Henry Flint and yours truly! And don't forget to check out the 2000AD booth for lots of signings, and to pick up your Comic-Con exclusives! Events / Big Bang signing: Day of Chaos - Fallout, 25th June! PJ Holden﻿ and I will be signing Judge Dredd: Day of Chaos - Fallout at The Big Bang, Dundrum, on Wednesday 25th June, 6pm... Be there! Books & Comics / Self-promotion time again! Video trailer for my upcoming novel Hunter! The shortlists for this year's Irish Comic News Awards have been announced, and voting is now open! I'm nominated in the Best Irish Writer Published Outside Ireland category, as is our very own Richmond Clements. Now, I realise that's a dilemma: Me or His Lordship, which to choose? We're both equally talented, especially me, and we're both fab 'n' groovy dudes. I'm taller, but Rich has more hair. Hmm... Well, I guess the only fair way is to go in alphabetical order by surname. Other 2000AD folks up for nomination include PJ Holden, Len O'Grady, John McCrea and Brendan McCarthy (the latter two competing in the Hall of Fame category). Also: 2000AD and Numbercruncher are up for Best Irish Creator Comic Published Outside Ireland. Leonia and I are just back from a triple-bill of Shaun of the Dead, Hot Fuzz and... The World's End! We've always adored the first two (Hot Fuzz is one of my all-time top-five favourite movies), but how does The World's End compare? I know you're all wondering... Well, we LOVED it! It's an absolutely cracking movie with some really great gags, nicely complex and clever story, and absolutely top performances. Definitely a worthy end to the Cornetto Trilogy - highly recommended! Well, we're departing shortly for Chicago for C2E2 - the Chicago Comic & Entertainment Expo, taking place from Friday 26th to Sunday 28th! If you're there, don't forget to visit stall #1030 in the exhibitor's hall for all your 2000AD and Judge Dredd goodies! It’s been an incredible year for 2000 AD with the DREDD movie and critically-acclaimed stories such as Day of Chaos, Brass Sun and Trifecta – but what’s in store for the Galaxy’s Greatest Comic in 2013? Three of our biggest Creators – Andy Diggle (The Losers), Paul Cornell (Wolverine) and Michael Carroll (Judge Dredd) – join Heidi MacDonald from The Comics Beat to talk about why you should be reading 2000 AD right now! Plus there may be some fairly exclusive - and very exciting - news about forthcoming 2000AD stuff...!